The main reasons we wanted to take a year out from University and work in industry was to gain experience in working in real world development projects, to increase our understanding of what we may be involved in once we graduate and to generally just improve our development skills. We both joined the Newcastle Digital Delivery Centre (DDCN) in September 2015 as Software Developers; wide eyed, bushy tailed and nervous. We had no idea what we were going to be involved in over the next 9 months. Before we started we thought working in Government would involve a standard 9 to 5 day, dressed in suit and tie and everybody would be working in small independent cubicles, in a very dark and Corporate office. As soon as we walked into the DDCN, we noticed it was the opposite. It was very relaxed and surprisingly modern. Never in our wildest dreams did we expect an HMRC office to be this open plan and colourful, surrounded by a sea of whiteboards. From the begining it was very apparent that we would become valued members. Our opinions and ideas were actually listened to. 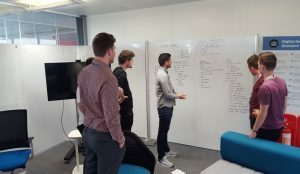 We expected we’d have to stick to our role and not have very much flexibility but actually our teams allowed us to take up roles we were comfortable in whilst we were learning new languages and getting our heads around the business side of the projects. Without going into too much detail, we've been involved in developing two online services (Inheritance Tax Online and the Childcare Calculator), helping to build what customers will see, alongside the behind the scenes programming which helps it to run. 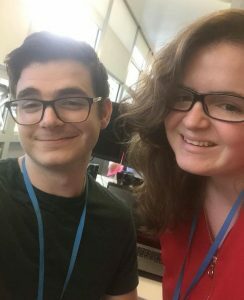 During our placements we've also both worked on prototyping these services and assisted in usability research, which involved travelling to Nottingham, Leeds and London, as well as using our home centre in Newcastle, to carry out testing with people using the services. We also started up a community for all our fellow digital placement students; to support each other and share knowledge. We promoted industrial placements by presenting to the Office for National Statistics and by holding a live Google Hangout across the country with the 2016 intake of placement students. And we got involved in other organised activities too like volunteering to organise the Easter Sport Relief event, where we managed to raise a total of nearly £700, which isn’t bad going! Overall we have thoroughly enjoyed our industrial placement year at HMRC. We’ve finished having learnt so much more than we expected to, having been involved in business discussions, usability research, development and prototyping, not to mention events in the centre (and the team nights out!). Thank you HMRC for this fantastic opportunity and hopefully we’ll be back again someday. As well as our industrial placement schemes, HMRC also offer digital apprenticeship opportunities. We’ll post another blog when our next round of recruitment opens. Another way to get into HMRC digital is via the Civil Service Fast Stream programme which is recruiting right now. Or you can register your interest in being a Digital and Technology Civil Service Fast Track Apprentice.